Grandipants.com: Be Happy. part 1. My actual "resolution" this year is to spend all the gift cards and gift certificates cluttering up our junk drawer. It took about four of them expiring for me to decide to do.something about it. My Intention for 2014 is to be happy. It seems simple enough, but my default feeling is anxiety and frustration so it is less simple than it would be for normal people. Naturally, to be truly happy, I would have to come into some independent wealth, so I could just live on fanciful whims all goddamned day but with that not happening anytime soon - I am going to make a conscious effort to do and find things that make me truly, legitimately happy. We're going to do one thing a month, because I gotta go slow with things that are unfamiliar and scary like happiness. For the past seven years, my dad has very generously provided me with an annual subscription to The New Yorker to make sure I do not lose touch with my superior, erudite East Coast roots while surrounded by these midwestern yokels. Without The New Yorker, I would know nothing about artificial food flavoring, the Miami Marlins, the favelas of Rio De Janeiro, and would not have read my three favorite articles of all time: Max at Sea, Trial by Fire, and the one that ALWAYS comes to mind when people ask what I've gained from getting the magazine for the better part of a decade: The Itch. But reading the New Yorker leaves little time for reading anything else. My subscription stopped unexpectedly at the end of November and I found myself cruising through three books in four weeks. So when Dad offered it back up yesterday, I said no. Because I want to read books. The books above and the unseen ones floating around in tubes of my (still in its packaging because I am waiting for my cover and do not want to take any chances) Kindle. Reading the New Yorker is wonderful but it also kind of feels like work. Its a weekly assignment I feel guilty about not finishing on time. Reading books just makes me happy. Right now I'm knee-deep in And the Mountains Echoed and its amazing. I am deliriously satisfied to be reading something so good. 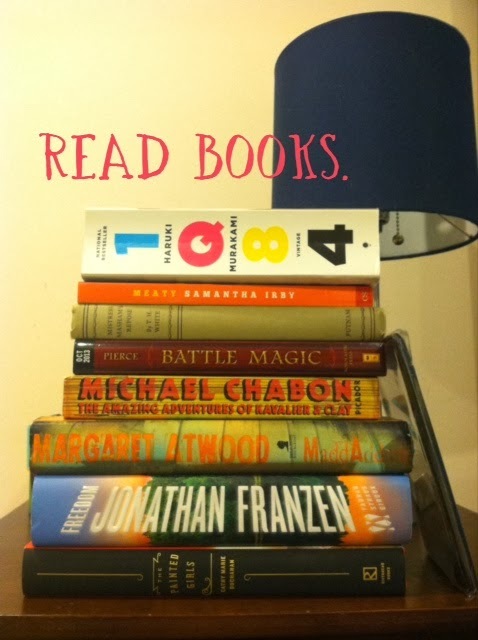 To books and happiness in 2014.